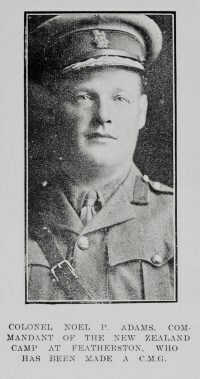 Lt Col Noel Percy Adams was commandant of Featherston Military Camp from the opening in January 1916 until war’s end. He was responsible for over 60,000 men who trained there in addition to the large staff which ran the camp. He was born in 1882, only child of Nelson solicitor Percy Adams. Noel went to Nelson College before attending Cambridge University from 1900, training for the law. In England he also became a part-time soldier in the university’s mounted infantry as well as representing in tennis and rowing. In 1910 Noel married Eileen Raw in London and the couple came back to Nelson where he joined his father’s law firm. He joined the N.Z. Territorial Army in 1911 as a captain in the Field Artillery. Captain Adams was 33 when World War One began. He was appointed adjutant (administration officer) at Trentham Camp in January 1915. The camp became the entry point of men joining the NZ Expeditionary Force from October 1914. When the camp was being rebuilt from July 1915, Noel, now a major, was briefly in command of Awapuni Camp before going to the tent camp at Tauherenikau. He was put in charge of the camp being built at Featherston after helping to choose the site. He was promoted to lieutenant-colonel before the camp opened. Noel and Eileen lived at Featherston during the war. As commandant, he hosted many visitors to camp, including the Governor-General, senior army staff and politicians. He also had contact with civilians over soldier welfare and relations between the military and local communities. In 1917 Lt Col Adams was appointed a CMG – Companion to the Order of St Michael and St George – in recognition of his work in training camps. The biggest trial at Featherston Camp was in late 1918 when the influenza epidemic killed over 160 and infected thousands. Noel went sick in November and was replaced by several temporary commandants. Soon after the war finished on 11 November 1918, he retired from the army. The Adams’ spent several years overseas, in USA and Britain, before returning to farm at Clevedon, east of Auckland. Noel Adams died in March 1954. He and Eileen are buried in a private cemetery at Matingarahi, Clevedon.